Brooke is an environmental champion in the House of Delegates and was the only Delegate from Baltimore City to be named a Green Legislative Champion by the Maryland League of Conservation Voters this term. From working to create a swimmable harbor to pushing for enforcement of clean water and clean air laws, Brooke has already gained a reputation as a stalwart environmental leader. By creating partnerships among the state, nonprofits, and local businesses, Brooke is developing forward-thinking solutions to keep our natural resources safe for years to come. She is a leader on our clean water laws are enforced. From her position on the Appropriations Committee, she has been vigilant about ensuring that our agencies are to clean up our waterways. 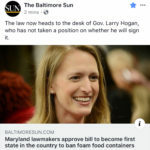 She was recently selected as a Green Legislative Champion by the Maryland League of Conservation Voters and was endorsed in 2014 and again in 2018 by the Sierra Club of Maryland. Brooke has sponsored legislation to rid Maryland of the scourge of plastic bags and styrofoam containers and has led the charge on enforcement by our environmental agencies, consistently using her role or position on the Appropriations Committee to call for more enforcement of clean water and clean air laws. The level of crime in Baltimore City, including in neighborhoods from Brooklyn to Bayview to Federal Hill to Otterbein and Canton, is unacceptable. The rise in violent crime that has occurred in the past few years is the result of a confluence of factors, including decreasing arrests, lack of successful prosecutions, reduced resources from the Governor’s agencies (State Police, for instance). In July 2017, along with her Team, Brooke authored Baltimore PROSPERs, a proposal for reducing crime through short and long term strategies. To read it, click HERE. After working on that framework, Brooke continued to be the leading voice in Annapolis to create a program to support and fund comprehensive community-based proven violence prevention work. Throughout Brooke’s term, she has consistently pushed to expand proven practices to reduce crime. In 2016, after the unrest, she helped lead the charge to pass a series of bills called the Baltimore Package, that funded programs like afterschool and community development work – all dedicated to improving life in the City and providing opportunities to keep young people off the streets. In 2017, she worked with the Appropriations Committee (on which she serves) to ensure that Baltimore Police Department received $2 million to install important new technology in squad cars to reduce the time police would be back in the office, and provided a tax credit incentive for BPD officers to live in Baltimore City. Because well-trained police are vital to a safe City, also placed a budget restriction on the state’s police training commission to require them to oversee enhanced efforts by BPD to improve training efforts for mid to low-level officers. In 2018, Brooke lead the charge to pass the State’s first-ever program to fund evidence-based gun violence prevention work. Her bill, HB 432,the Public Safety & Violence Prevention Act of 2018 had two big parts. The first part created the Maryland Violence Intervention & Prevention Program (MD VIPP) – that will invest in proven, public-health based practices in high-crime areas of the state to reduce gun violence. The second part of the bill makes direct grants to several Baltimore City violence prevention programs, including the State’s Attorney’s office, the LEAD Program, Outward Bound, and the BPD. Violence in Baltimore is extremely complex. It’s infuriating and frustrating. Brooke is continuing to work to find ways to reduce violence in our neighborhoods by passing legislation, working with partners, and pressuring the executives – both the Governor and Mayor – to do more. At the same time, Brooke has been a leader in criminal justice reform efforts, empowering formerly-incarcerated individuals to lead productive and safe lives. She helped ensure passage of a strong version of the Second Chance Act, a bill to allow certain convictions to be expunged to enable Marylanders to access housing and jobs. She has also worked hard to dismantle the school-to-prison pipeline, by passing bills such as a prohibition on suspending and expelling our youngest children – like those in Kindergarten. Brooke has been a leader on bail reform issues,writing a letter that prompted the the issuance of an Attorney General opinion in 2016 that led the Court of Appeals to implement a major rule change on cash bail. This rule change should help keep truly dangerous individuals accused of crimes behind bars – and ineligible for bail – while awaiting trial, rather than allowing those who have access to money to buy their way out. 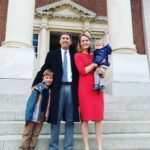 The first bill that Brooke successfully shepherded through the General Assembly closed an egregious loophole in Maryland’s Family Medical Leave Act: it ensured that, for the first time under Maryland law, employers could not fire workers for asking to use their accrued leave. A Bayview neighborhood resident brought this issue to Brooke’s attention soon after her election when he told her he had been fired by his company for asking to use leave to care for his father who was ill with Parkinson’s. As a mom of two, Brooke personally understands the needs of working parents and the demands of modern family life. Brooke has been a champion for the Healthy Working Families bill (the paid earned sick leave bill), and has supported increased access to high-quality and affordable child care options for Maryland families. Brooke is passionately committed to workers’ rights. As an attorney, she has represented many hard-working Marylanders whose rights have been violated. She fought for and won back pay for the employees of the ESPN Zone who were laid off in violation of the federal WARN Act, and also represented school bus drivers in Baltimore who were owed overtime pay. She has also represented individual workers who have put in their time, working long hours to provide for their families, but who have not been paid all of the wages they earned. Brooke has continued to lead the charge for working men and women in the Assembly through her advocacy for the Paystub Transparency Bill. Brooke and her husband Eben are committed to raising their family in Baltimore and sending their son to Baltimore City public schools (Teddy will enroll in Kindergarten at Hampstead Hill Academy in fall 2018!). Brooke understands the challenges that Baltimore parents face and believes that safe, quality public schools are the foundation for attracting and keeping families in the City. Brooke is dedicated to making sure that every public school in the district has the highest quality teachers and principals, and provides a safe learning environment for every student. As a member of the Appropriations Committee, Brooke has been a leader on funding for City Schools from the first day of her term in 2015. She led passage of a bill to provide free public transit to City students on MTA busses, and was part of a small team that worked to ensure that the State would help City Schools dig out of a large deficit in the 2017 session. During the 2018 session, she is again part of a core group working to ensure that the state provides adequate capital resources to City schools to provide high quality learning environments for all kids. Brooke also regularly communicates with the principals and teachers in her district. For instance, Brooke partnered with the principal at Maree Farring Elementary/Middle School in Brooklyn to advocate for additional space for students in this overcrowded and growing school. She worked with North Avenue and the Department of Housing and Community Development to help secure funding for the purchase of the building next to the school to be renovated and used as additional classroom and community space. But for her efforts, this opportunity would have been lost. Across the district, Locust Point parents and residents reached out to Brooke in summer 2015 about their desire for a new library at FSK Elementary/Middle School in Locust Point. Brooke worked to ensure that QZAB funding from the federal government was secured by the state and targeted at FSK so that the school could capitalize on a grant program with the Weinberg Foundation to build new libraries. She joined students and parents at the ribbon cutting of this new, beautiful library in October 2017. Brooke also understands the challenges that parents face in securing high-quality, affordable child care. She will continue working with parents, regulators, and City officials to (1) increase Child Care Subsidy payments for working families (currently many Maryland families are on a waiting list to receive help), and (2) identify and eliminate barriers to starting new child care facilities in Baltimore and around the State. Creating high-quality child-care provides jobs, starts our children on a solid path from their first days, and enables parents to return to the workforce confident that their children are being cared for. It must be a priority for Maryland, and Brooke will fight to keep attention focused on this critical need. When a constituent or City leader needs help with MTA, they call Brooke and she helps makes a change. In 2016, Brooke passed the first bill to overhaul the Maryland Transit Administration since its creation (HB 1010 in the 2016 Session). Unfortunately, Gov. Hogan vetoed that bill. Undeterred, Brooke continued to lead on transit reform and ushered through a bill in 2017 to eliminate the farebox mandate recovery that hampers MTA’s spending priorities. This bill, which has been discussed for over 20 years, will give MTA the ability to use its funds in the most efficient and effective way, to lead to a better user experience. As a member of the Appropriations Committee, Brooke is also able to shine a light on the relatively scant funding that MTA receives under the Hogan Administration versus what a truly excellent transit system would need to offer a first-class rider experience to others. Baltimore is only as strong as its neighborhoods, and sustaining vibrant neighborhoods is the key to the City’s future – and the State’s. Fortunately, we have a strong network of community groups in place in many neighborhoods. These groups provide excellent starting points for strengthening our community. But they cannot regrow neighborhoods on their own – they need and deserve support from government and elected officials. Brooke believes that our government should always be focused on strengthening our communities. Brooke has led on bills to support our neighborhoods, like increasing funding for the Baltimore Regional Neighborhood Initiative, an innovative and effective community development program that has allowed the Southeast CDC and the Greater Baybrook Alliance to invest millions of capital dollars from the State into neighborhoods in Southeast Baltimore and in Brooklyn and Curtis Bay. Brooke has also supported accessible integrated and affordable housing through bills like the HOME Act and through her work on the Joint Committee to End Homelessness. Finally, Brooke has championed parks and green spaces in Baltimore. She helped pass a once-in-a-generation bill to increase funding for Program Open Space from its previous level of $1.5 m/year for Baltimore to $6 m/year to Baltimore and secured $300,000 in the first year for lighting in Patterson Park. She will continue to work to enact reforms and bills that support our Baltimore communities. In District 46, our neighborhoods are home to a variety of small businesses – from urban pirate ships to tech companies to medical companies and law firms. Brooke understands that flourishing cities have strong economies; strong economies rely on thriving businesses to create jobs; and thriving businesses are founded and led by ambitious, risk-taking entrepreneurs. Brooke has an extensive record of supporting these entrepreneurs and their small businesses to create an economy that works for us all. Brooke has consistently championed increasing available capital for entrepreneurs, acting as the lead sponsor of the the Angel Investor Tax Credit bill, which would provide a tax credit for qualified investments in startups in Maryland. This bill would promote early capital investment that helps entrepreneurs get their fledgling businesses off the ground. It’s a bet on innovation and economic growth that starts and stays in Maryland. Brooke actively meets with and advocates for individual business owners. She also works closely with Community Development Corporations like the Southeast CDC, the Greater Baybrook Alliance, the Westport CEDC, and various Main Street programs in her district, supporting and advocating for their needs. She worked closely with Fell’s Point Main Street to help champion and expand the water business improvement district so that Fell’s Point is now part of the Waterfront Partnership. Brooke is a champion of women and minority-owned businesses. In 2015 she spearheaded, organized, and sponsored the Baltimore Business Women’s Roundtable, a forum for female business owners to access training, learn from panel discussions, and build meaningful connections. She also practices what she preached: her largest fundraisers have been at women owned businesses like SoBo Cafe and Teavolve!